Anna Properties has projects at Seaport-Airport Road (Florenza, super luxury, starts at Rs 2.5c), Tripunitura (Casa Bonitta Phase II, Premium, starts at Rs 68L), Near Lakeshore Hospital (Tierra Villas, 85L onwards and Signature Villas, 400M from bye-passe), Parvoor (Lavendar, 75L onwards), and Kumalam (Highway Gardens, Sky Villas, Super Luxury Apartments, Near Ramada). The projects have less than twenty villas each. Common amenities include a club house and a swimming pool. Several other projects are Sold Out: Eden Garden (near Lakeshore, Super Luxury, starts at Rs 1.59c), Le-Celeste (near Le Meridien Hotel, Luxury, starts at Rs 1.25c), Queensland (Edappally, Premium, starts at Rs 73L),etc. Skyline Ranch (Tripunithura): 72 super-luxury villas designed in an American ranch model on 12.6 acres in the heart of Tripunithura town with excellent amenities: open air theater, cascading water body, barbeque, basketball half court, video phone security system, CCTV surveillance system, security guard movement monitoring system, waiting area for drivers, intercom, compound wall with security cabin, swimming pool with wading pool for kids, recreation hall, sauna/health spa, passenger lift, games room, fitness center, home theater, and children's play area. Square footage of the homes vary between 2000 and 4187 with pricing set at Rs 6500psft. The total price range is between Rs 1.5 crores and Rs 4.5 crores. Current Status: The project is complete and ready-to-occupy with very limited availability. Olive Kalista (opposite Infopark Kakkanad): Has eleven bungalows along with the 740 apartments across 5 towers. The bungalows are priced at a whopping Rs 3Cr range . Current Status: The project is complete with very limited availability. Chakolas Habitat Bougain Villas (near Thevara, Cochin): 22 villas with garden areas facing the backwaters near Thevara. Amenities include club house, air-conditioned health club, landscaped garden on the waterfront, air-conditioned party room, swimming pool, and jacuzzi. There are two alternate plans both with square footage around 2850. Current Status: The project was to complete in 2013 but is delayed. Limited Availability. SFS Gardenia (Vazhakkala, Cochin): A premium high-end (private pool & jacuzzi, air conditioning, advanced security, etc.) villa project with a great location. The ten-year construction guarantee on workmanship is a unique feature of this villa project. 15 villas and two plans - 2880sft & 3804sft. Current Status: Complete and Sold Out. Shreeji Dwaraka (Tripunithura): 18 villas across three different models (1622 sft, 1943 sft, and 2500 sft) near Tripunithura off Mulamthuruthy Road. Amenities include club house, fitness center and kid's play area, party hall, swimming pool, and convenience store. Pricing is Rs 3400psft, down from Rs 3600psft in 2011. Total price vary between Rs 52L and Rs 82L depending on square footage and land area. Current Status: Project is now Complete - very limited availability. 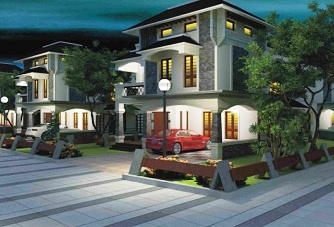 Vrindavan Garden Villas (Irumpanam): 18 villas on 1.8 acres. Two plans: 1424 sft and 1477 sft. Current Status: The project is sold out but Phase II is launched and there is availability there. Trinity The Garden (Alwaye): 42 villas on 8 acres of land. Main amenities include club house, health club, swimming pool, and amphitheater. Square footage varies between 3800 and 4270. Pricing starts at Rs 1.87 crores. Compared to their flat projects, construction progress is very slow on this project. Current Status: ready-to-occupy, very limited availability. Cityscapes, near Tripunitura: 8 four-bed villas sized between 1800 sft and 2250 sft in a 35 cents gated community, located 900 meters from East Fort Junction off Kottayam State Highway. Current Status: construction on-going. Mather Metro View, Alwaye: Around 15 villas sized between 2300 and 2800 sft (5 cents to 7 cents) located near garage city bus-stop in Alwaye and adjacent to the upcoming Kochi metro station. Swimming pool, club house, multi-gym, childrens's play area, and a shuttle court are the main amenities. Mather Green Ranch, Alwaye: Around 36 villas in several plans sized between 1700 and 2800 sft (4.5 to 7 cents) located 1.2KM from UC College in Alwaye. Amenities are similar to the Metro View project with a couple of additions: Solar lighting in common area and indigenous water source. Current Status: These two projects are still pending. Wintergreen (off Kakkanad): Three and Four bedroom villas in five plans sized between 1354 and 2754 sft located near Wonderla Kochi at Pazhathottam (around 14KM from Collectorate, Kakkanad). Children's play area is the main amenity. It is in a gated community with intercom & security cabin. Confident Peninsula (Maradu): Peninsula is a luxury villa project (14 grand designer villas - invitation based) that has a great backwater-front location just off NH47 in Maradu - it has been in an early pre-launch/design phase for several years and so is unclear when the project will officially be launched. Travancore Grand County (Upper Kakkanad): 30 premium luxury villas similar in concept to their Swiss Gardens project located in the same general area near Suburban Club off Pukkattupady Road. Current Status: The project is in progress and there is limited availability. They have the following other villa projects in Kochi with availability: Glenwood New Age Villas (new project near Smart City, starts at 1.35c), Queens Park Classic Villlas (Kaloor), and Swiss Gardens Club Villas (Upper Kakkanad). VC Hills Smart Villas (near Smart City): 30 modern three and four bedroom villas (three plans between 1168 sft to 2164 sft) on 3 acres of land in Edachira. Two apartment blocks are also planned in later phases. Current Status: Very limited (around 5) availability. Handover complete on a few houses. VC Homes has also announced a villa project in Aluva but details are yet to be released. Asset Insignia (Kaloor): 14 limited edition luxury villas (~3100 sft each) in 3-levels with a vertical garden concept design. Luxury amenities/features of the project include air-conditioned bedrooms, thermal roofing, luxury club house, fully loaded kitchen, aqua gym, etc. Current Status: Construction is in a very early phase although availability is very limited. Asset Castle (Chottanikkara): 16 villas (1600 sft to 2000 sft) very near Chottanikkara Temple (100 meters from main road - panchayat road frontage). It is a gated community with a clubhouse and play area. Other features include individual well for each villa, Inverter/Individual DG backup, solar lighting in common area, and bio-bins. Current Status: The project is complete and handed over. This was their second villa project in the area after their flagship Asset Kasavu (Kalamassery). The World Township - Nest Infratech (Choondy, Alwaye-Perumbavoor private bus route): Integrated township of 4BHK and 5BHK villas (2158sft to 2587sft on 6 cents at upwards of Rs 1cr) along with 2BHK, 3BHK, and Duplex (1078sft to 2702sft starting at Rs 29L) on 25 acres (first phase on 10.64 acres) located 2KM from Alwaye town. The first phase has a single tower with 150 apartments and 90 villas. Pricing for the apartments are set at Rs 2700psft and Rs 5000psft for villas. Features include 6000sft multipurpose club house, meditation center, carrom room, swimming pool with kiddie pool, sauna and jacuzzi, barbeque counter, etc. Current Status: The project has slipped several years. Campus Woods is another project announced near CUSAT on a 1-acre campus. Aangan - GoodEarth (Thuthiyoor Road opposite DLF on Seaport-Airport Road): 03/2014: This high-end villa project is adjacent to SEZ, Kakkanad on Thuthiyoor Road. It consists of 20 villas on a 2.5 acre property. The villas are upwards of 3200sft on 7 to 9 cents of land. Pricing starts at Rs 2.53c for the available villas. It is being developed as a sustainable eco-friendly community with the following "green" features: 1.5 acres set aside for greenery (includes private plot yard areas), rainwater harvesting, organic waste management system, and solar lighting for common areas and solar heaters for villas. Luxury amenities include indoor pool, health club, amphitheater, DG backup, etc. Current Status:Work is in full swing and there is limited availability. Kent Oakville Luxury Villas (Vazhakala): Eleven villas as part of a five-acre township that also includes seven apartment towers. Current Status: The villas are completely sold-out and construction is going on in earnest. There is very limited availability in some of the towers. Kent Nalukettu Palm Villas (Kakkanad): 111 villas (2294 sft and 3086 sft) near Athani Junction in Kakkanad (the land originally belonged to Fort Township project and was sold to Kent around 2011). Amenities include association room, business center, guest suite, library, club house, jogging track, yoga center, swimming pool with baby pool, multi-gym, indoor shuttle court & mini convention center, etc. Current Status: The project is complete and ready-to-occupy - limited availability. The Sovereign Mediterranean Luxury Villas (Panangad): 20 first-of-its-kind (backwaters, sailing club next door, and Mediterranean styling) luxury villas with square footage upwards of 3000. Amenities include fully equipped health-club and swimming pool. Current Status: Limited availability. Palm Meadows II (near Lakeshore Hospital, Maradu): fourteen three and four-bedroom villas between 1920 sft to 2700 sft forms Phase II of the builder's very successful Phase I project that consisted of 36 luxury villas on 5 acres. Current Status: Very limited availability. Blue Waters (Panangad): The ultra luxury project got a huge boost recently when Sachin Tendulkur purchased one of the homes in the project. Current Status: Completely sold out. Ansal City Township (near Ayurveda College, Tripunitura): This is a very similar project compared to their first project Ansal Riverdale in Eroor: river-front 10-acre property with luxury villas with the following amenities: jogging track, health club, gymnasium, boat-launch access, swimming pool, play areas, etc. Current Status: Project is delayed. Springfield Garden Villas (Aluva): 36 luxury villas in a 2.6 acre lot located off Munnar Road from Aluva near Carmel Hospital. Current Status: Construction is in progress and there is availability. Orchard County (Tripunitura): 12 luxury villas in a 1 acre lot located in Tripunitura near Irumpanam Junction. Current Status: Project is complete. Jairaj Symphony (Kakkanad): Nine four bedroom villas in Kakkanad near Navodaya Junction off Kakkanad-Pallikara Road. Pricing starts at Rs 1.35c. Current Status: The project is progressing slowly and there is availability. Hest Hill Village (near HMT): 24 three-bedroom villas (1611, 1820, & 2045 square feet plans) located on Kaipadamugal Road (off Seaport-Airport) in a ~1.10 acre plot. The 1611sft plans are twin houses. Current Status: The project is in progress and there is very limited availability. Note: Several small builders are also active in many of the hotspots in Kochi. Most rely on word-of-mouth although some such as Bazaz Constructions (Chinnar Villas, Rajagiri Valley) market through local media outlets. Mather Veneziano (Koonamavu, Cochin - 9KM from Edapally off NH17): Has 40 villas with three different plans (1885 sft, 2275sft, 3365sft) in 5.12 acres of land. It is modeled after Venice with waterbodies and greenery. The villas are priced upwards of Rs 1cr (Rs 4700 per sft plus land cost at Rs 4L per cent for area above 6 cents). Twenty six are sold and so availability is limited to 14 villas. 11/2012 Update: This project is no longer listed in their website and so is probably in pending status! 03/2013 Update: The project was relaunched by Asten Realtors (Asten Mather) earlier this year although details are not yet forthcoming. 05/2013 Update: The price has been increased to Rs 5000psft effective from June 1, 2013. Availability is very limited for the smallest plan (1885sft). Galaxy Green Woods (near Tripunithura): Value for money is the basic idea with this project. Plot size varies between 3.4 cents and 8 cents across six different plans that vary in size between 1309sft and 3014sft. Amenities are minimal - guard room for security with intercom, internal tarred road with lighting, garden, and children's play area. Pricing is set at a very low Rs 2550psft - the total rate varies between Rs 33.4L and Rs 76.9L depending on square footage and land area. Final Update - 2015: The project is complete. National Empress Garden (Vennala): 16 villas in 1.1 acres as part of a larger township on 4 acres with two and three BHK apartments across four towers. About half the plots are still available and they vary between 4.45 and 8.51 cents in land area - the house square footage varies between 1922 and 2428 sft. Good amenities (club house, health club, swimming pool, and security) but the pricing is steep. It varies between Rs 1.13 and Rs 1.53 crores depending on square footage and land area. Final Update - 2015: The villas are ready-to-occupy and availability is very limited. Anna Properties Vivante (Near Lakeshore hospital, Maradu): 16 villas in 1.5 acres of land just one kilometer from NH-47 near Lakeshore hospital. The land area of the plots vary between 4.37 cents and 10 cents with the square foot rate set at Rs 4250 - the total rate varies between Rs 78L and Rs 1.66cr depending on lot size and square footage (1845sft to ~4000sft). Availability is limited to 7. Final Update - 2015: The project is still on-going, although it is completely sold-out. Symphony villas (near Edapally): project of cyber real estate developers has an ambitious "Swiss type villas with American landscaping" project near AIMS, Edapally. Pricing for the first six villas (out of 24 total) is set at between Rs 51L and Rs 1.25Cr as a launch offer (call 96566-66695). The pricing seems very good and the builder projects it as the most technically advanced project in India. But the builder is new and so there are associated risks. Final Update - 2015: Despite heavy marketing, the project did not take off and was put on hold. Flair Alliance Waterface (near Veegaland): Around 80 lots in a gated community just before the bridge and Veegaland in the Ernakulam-Perumbarvoor main road. Amenities include swimming pool, club house, health club, riverside park, boat club, gym, indoor shuttle court, fishing deck, and security. Pricing varies between Rs 83L and Rs 1.12cr depending on square footage (1870 and 2520) and land area (between 4 cents and 5.3 cents). Additional land is Rs 7L per cent. The square footage rate is set at Rs 4000psft including land. Final Update - 2015: very limited availability - mostly only resales. Shwas Aqua City (Alwaye): An ambitious project marketed as the largest waterfront residential project in Cochin on 17 acres on the banks of Periyar - ten 25-storey towers and around 50 villas. The 2000sft Palm Street villas are released now in a pre launch offer for Rs 66L. Pricing is very competitive and the location is great but Shwas doesn't figure among the top builders and so it is unclear how well they can execute this large-scale project. Final Update - 2015: The project status is still listed as "nearing completion". The project is delayed several years and there are many customer complaints. Coral Olympus (Maradu): 20 luxury villas just 1KM from Le Meredien off of NH-Bypass on 5 to 8 cents of land. Square Footage starts at around 2100. Amenities include clubhouse with gym, party room and indoor games, swimming pool, children's park, and accommodation for visitor's drivers. They also have a mini-township project with villas and flats in Alwaye called Coral Utopia - its location is just off the proposed Seaport-Airport road. The builder is new. Final Update - 2015: The projects are still listed as "ongoing" although their website went offline as of 09/2015 due to non-renewal of the domain (coralgroupindia.com). Confident Bellatrix (Upper Kakkanad): Twelve villas as part of the Auriga III township - looks like they had plans for an A and B blocks for that project which was since cancelled. That space is now relaunched as villas. Two types of villas are on offer on ~4 cents of land with a square footage of 1651 and 1814 respectively. The "pre-launch" offer price is very competitive at Rs 55L and Rs 60L respectively and that includes electricity deposit, all taxes and club house charges. Amenities include club house, swimming pool, kids play area, and party hall. Construction is set to begin in April 2012 and handing over is scheduled for April 2013. Upper Kakkanad is a glorified name for Pukkattupady, around 12KM from Kakkanad and 7KM from Seaport-Airport Road. KMEA Engineering College and a number of other developments are in the area. Final Update - 2015: The project is complete. Villa Rio - Dream Flower Housing Projects Private Limited (off NH Bypass, Chalikavattam, Vyttila): 11 luxury villas just 1.5KM from NH Bypass on 4.5 cents to 7.5 cents of land. The project has only very few villas still available to book. All-inclusive (except registration) pricing starts at around Rs 1.35c. The project was launched in August 2011 and is scheduled for completion by August 2013. Amenities include indoor pool facing the river, gym, club house, kids play area, DG power backup, landscaped garden, rain water harvesting, two-car garage, etc. Final Update - 11/2013: Handover is complete although only a couple of houses are occupied - the rest appears to be NRI investment properties. The process went smooth. One concern is that there is very little open space and already there was a problem whereby the neighbors complained as KSEB attempted to install a transformer for the property outside the community walls. Swiss Gardens - Travancore Builders (near Suburban Club, off Seaport Airport Road): Ambitious new villa project with 40 premium villas in 8.5 acres of land. The project is aimed at the high-end consumer and is priced at over Rs 2.5 crores for a 3000 square foot villa on 7 cents of land - launch offer pricing @ Rs 6500 psft (regular pricing @ Rs 6800 psft). The plan calls for a premium club facility with plenty of parking. The internal roads are 6 meters with the main road to the club facility at 10 meters and the public approach road to the project just 5 meters. The Millennium Club spread over 3 acres of land is a highlight of this project. Final Update - 2015: The project is completely sold-out. Periyar Hermitage - VC Homes Ltd. (off Companypady Junction, Aluva): 55 villas and 80 apartments in two blocks on over 2.5 acres of common park area. The overall land area is 7.5 acres on the banks of River Periyar. The villas are priced at around Rs 5000 psft with limited availability. The apartments have balconies with river view. The project is in Phase II. Final Update - 2015: Both phases of this project is complete. Kasavu Villas - Asset Homes (behind Rajagiri School, Kalamassery): 50 villas in 4.10 acres of river-side land. The villas are upwards of 1600sft on between 4.5 cents and 9 cents of land depending on the plot selected. The premium project is designed by Site Concepts International Singapore. Exquisite features include five-star club house facility, designer yard, landscaping with a green turfed paved entry to the car porch, a designer half compound wall, automated LED lighting in common areas without posts, and Purified water supply for all villas. The villas are quoted at Rs 7000psft which translates to a price of Rs 1.12cr for a 1600sft house on 5 cents of land. Availability is limited to 19 plots. 04/2013 Update: Completion schedule moved to December 2015. Final Update - 2015: The project is delayed and will handover only in 2016. It is completely sold out. Noel Fragranz - Noel Homes (near Suburban Club, Vallathol Jn., Thrikkakara): 36 villas with two plans (~2300 sft and ~2700 sft). Noel has had success with a few other villa projects in the area and this is their latest one. Final Update - 2015: Construction is in the final stages and the project is completely sold out. Ansal Riverdale - Ansal Buildwell (Eroor): The township is a 11-acre waterfront property located off Chakkaraparambu Road in Eroor, around 2KM from NH-47 byepasse. Villas are from 2570 sft to 3540 sft. Amenities include club house, swimming pool, jogging track, underground electrical wiring, etc. Final Update - 2015: The project is completely sold out. Kalpaka Lakeside Villas - Kalparka Builders (Maradu): Twelve river-front luxury villas located near Lakeshore hospital off MLA Road. Final Update - 2015: The project is nearning completion and is completely sold out. There were many other villa projects in the area despite the fact that real-estate was going through a dull phase. Some builders had financial problems and at-least some of them were either incompetent or unscrupulous - many stories were posted on the net regarding people who felt conned by builders - some of them were known to have heavy marketing presence in gulf and other countries with the sole purpose of roping in unsuspecting "customers". On our part, we shied away from investing in a villa at the time. Nothing really stood out in our price range and the risks seemed substantial. To avoid bad situations, it is best to scout around for properties on your own and go with a reputed builder. Even when going with a reputed builder, it is best to go for one nearing completion even if that means paying a premium. We were enamored with this market area as it seemed to offer the best of both worlds: the flexibility to build a house when you are ready while having the rest of the infrastructure in place. When we looked in 2011, there were several walled-in plots offered for sale. For small-time builders, selling plots is a relatively low-risk way of doing business. This can be a good deal for buyers as well, as there is a certain amount of common infrastructure built-in. Ultimately, such projects can take a long time to be completely built-out, as buyers have no obligation to construct a house immediately. So, it attracts many "investors" as opposed to buyers who want to construct and live in the house. The result is that many of these projects end up looking like ghost towns - walled in with internal roads and plots marked but no houses and no maintenance whatsoever. For this reason, it is to your advantage to look for places where there is "an upkeep" built into the contract with the developer. Harit Havens (7KM from Alwaye off Alwaye-Perumbavoor Transport Bus Route): Around 50 plots (10 cents to 15 cents - ~38 are sold, six each in sector 1 and 2 are still available) with 5-star resort like facilities on 17 acres spread across three hills. Pricing is set at Rs 5L per cent (Rs 4L is the land and Rs 1Lfor development)and the land area varies between 10 cents and 15 cents. Plot purchase is not tied to any commitment with respect to building a house - Maintenance expenses are collected at Rs 3K for villa owners and Rs 0.5K for plot owners currently. Jewel Bloomingdale (6KM from Alwaye off Munnar Road): The project consists of 35 plots in 3 acres from 4 cents up to 23 cents. Amenities are minimal - tarred road (5 meter), security cabin, landscaped garden, electricity and water facility. Close to twenty plots are still available. The project is near the medical college and other related institutions coming up in Chungavelly from the Rajagiri group of institutions.Pricing for the lots are set at Rs 3.25L per cent. Nucleus Premium Properties (Nedumbassery Airport): Plots for sale at Nucleus Greens near Nedumbassery Airport (14 plots at Rs 1.99L per cent, 9037-300100), Nucleus Parrot Enclave at Thathampilly (Rs 1.25L per cent), and Nucleus Info Valley near Smart City Kakkanad. Fort Meadow Township (Ambalamedu, Tripunithura): A 5 acre township with 50 plots located 4KM from Seaport Airport Road off Refinery Road. Promised amenities include 24 hours security, compound wall, swimming pool, health club, recreation area, children's play area, dedicated transformer with underground cabling, and landscaped open area. Pricing for the lots are set at Rs 3.5L per cent. Overall, we decided not to invest in any of them as we believed the risks were substantial. The closest we came was investing in Harit Havens - the community was the most developed (beautiful landscaping, internal roads, security, jogging track, club-house w. swimming pool, etc.) among the ones we scouted and the location was just brilliant - on a hillock overlooking a vast paddy field. Ultimately, we decided against it as the whole enterprise was a one-man-show, which meant additional risks for buyers. I wud like to have a genuine feedback. We heard of Anna Properties - Casa Bonitta II villa and wish to invest on the same. We are said that the price is Rs. 4200/sqft and we are in a confusion whether its a good deal. Is that rate reasonable in a place like Tripunithura? How reputed or good is this builder? Kindly advice asap. Anna Properties Casa Bonitta project was launched in early 2012 & the original plan called for delivery in 18 months. Their brochure says it is very near Smart City Phase II. It is best to first visit the place - the major developments are expanding to this area as well but will require some patience (may be a decade or so) to realize the potential. The pricing looks good. They have a road-show at Thiruvalla (Club 7 Hotel) on December 26th & 27th 2014 - it might be worth to check-out this. Your blogs have been very informative for me in finding good housing projects in Kochi. I found Heera Vaastugramam, Mather Leisureville and Infra Meadows from some property listings. Could you please comment on them? We are relocating next year to Kochi and I'm looking for a place with a good community so that the kids can make friends and integrate easily. Thx. The three you mention are all in the same general area: off Seaport-Airport road & Infopark Expressway near Chittethukara. Mather Leisureville is the smallest (just ~10 houses) but they have the best amenities (full-fledged club-house with indoor swimming pool, underground cabling (includes electric cables), western-style open layout, etc. Downers include location adjacent to Brahmapuram waste-processing plant and low occupancy. Infra Meadows (~25 villas) have the best access (very walkable to Seaport-Airport road) and Noel Ivy Creek (a similar project) is adjacent to it. Heera Vastugramam has 120 villas and is around two-thirds occupied. It is the most spread-out (~10 acres) and it has plenty of play-areas and such. Amenities are a little light however - no swimming pool. Also, party hall and club house are bare-bones. Thanks for the feedback. I couldn't find any info on Noel Ivy Creek, do you know no.of villas, occupancy rate, amenities, general price range etc. Also please let me know if there are any other villa communities in the area. I'm looking for something with higher occupancy rate and decent amenities. Thx. Ivy Creek has around 25 villas and has almost full occupancy. There are several villa projects in the area - Confident Capella, Olive Courtyard, Manjooran Orchid Meadows, Kent Naalukettu, Noel Palm Dales, Mather Green County, and villa projects of Divine Homes & Happy Homes (all off Seaport-Airport road) to name a few (Confident Capella & Olive Courtyard also have flats). It can get very hard to research remotely and it is best to commit to something only after visiting (and if possible after doing a trial run by renting at the place you want to buy). Really appreciate your efforts which will certainly help many of us who are living abroad.I am not from Kochi. So Could you please tell me whether Varapuzha will be a good place to invest in residential plots? Natural beauty & accessibility (NH17 & waterway) is what makes Varapuzha attractive. There was a Lonely Planet mention about the waterway connecting Ernakulam to Varapuzha as well. i wish to settle down in cochin. looking at a budget villa.How do u rate anna prperties in terms of construction, and their promptness in completing projects. Anna properties is a decent builder but delays are the norm even among reputed builders. Budget villa projects are more common in the border areas of Tripunitura. Anna Properties, Asset Homes, Trovit Homes, Sophia Builders, etc. have ongoing villa projects in areas such as Chottanikkara and Puthencruz. Any feedback on builders Meriden or MFAR (shimmer heights)? Also is there any villa projects planned in Kochi by sobha or puravankara? Couple of months back I looked at one of the villa projects by Anna (near panangad) and the site manager was explaining to me that Sobha and Lulu is planning a villa project near by island across from their site. Appreciate your feedback. Meridian Homes is a well-known builder in Kochi. Shimmering Heights is in the mold of a new trend in premium apartment projects: waterfront location, 30+floors, skyvilla concept, etc. Pricing generally starts in the 5000+ psft range. Comparable projects include Tower 11 & Blue Waters (both by Meridian Homes in the Maradu waterfront) and Nautica (by Asten Mather at the Panangad waterfront). Also, check-out earthspacelife.com - their project may be what the site manager referred to. Thank you ks. Any feedback on AMV Builders (silver shores)? I have not checked out AMV Silver Shores, Nettoor. It is their first residential project. They have a few commercial projects and AMV Tower in Kundanoor is complete. I wish to buy an apartment in kochi,which can be rented for decent price.as I am abroad I don't have any idea. kindly guide me. your posts has been very helpful thank you Sir ! I wish to move to cochin, two projects I am looking at request you feed back on the average price and value for money on those and most imp their quality of construction, also I saw u mentioned on post above that the prices are low and it is dull market now, if you could advice on a good villa 3000+ sqft with a resonable land area in a good and peaceful community with acess to utilities and preferably a mosque near by. Once again thank you SIR for helping us buyers out with some genuine feedback. This post is very informative and appreciate your work. Till now I was not aware of well developed gated communities like fort meadows,Harit heavens etc., other than villa projects in Ernakulam. As I staying in outside kerala,it is very tough to find out the details about the upcoming townships like this. It would be great,if you can share some details about this. Trust me .. Dont pay for any flats or Villa's which is in construction state even if they are reputed.. They take ur money and invest it elsewhere . You might have to wait 3 to 4 yrs more than time they promise.. Buy only completed onese since you will get better intrest in bank rather than giving these frauds.. The premium u pay is less than the time you waste and if u threaten they will say it will get delayed more and find some excuse....So buy only completed ones... In Aug 2014 the price of cent in kakanad area is about 10-12 lakhs per cent and places like varapuzha is 3 lakh to 4.5 lakh.. Dont be foolded by names saying its just cochin like Apple a day Fraud company. Unfortunately, the regulations and the legal framework are such that getting builders to expedite projects is not easy. To make matters worse, most builders routinely handle legal proceedings by using delaying tactics. This is very effective as the builders have nothing to loose while the buyer's have to go through years of delay in courts. NBCC valley viewproject in ambalamugal is it worthy? On NBCC Valley View, the location is very good and as it is a government project, your capital is most probably not at risk. NBCC have completed several projects outside Kerala but Valley View is the first one in the state. As such, customer Service and logistical issues may be downsides: for everything including submitting the initial application, you have to deal with their office in Delhi. How reliable is nest infratech. They don't have any completed projects. Is it safe to invest in their campus woods project near cusat? NeST projects are delayed significantly (~2 years). Although, NeST group is a diversified multinational, real-estate is a new area for them - possibly going through growing pains currently. Overall, capital should not be at risk, given their much bigger corporate backing. Hi. Could you please advise if buying a plot in Harit Havens is recommended. We plan to buy a villa plot in outskirts of Kochi with all facilities and also near access to the city Centre. We would like something near marine drive. But I have not yet seen any good ones. I am looking for something like Ansals Riverdale. Do please share your comments on a similar project. Harit Havens appears to fit the list. Regarding Harit Havens, people have generally looked at it as a long-term investment/second-home rather than a primary abode. Last I checked, the project owner and one other family are the only permanent residents. Overall, it is very well maintained and they have a functional resident association. Great information about builders in kochi.. thank you for sharing this. Nice share. Thumbs up. By the way Looking for apartments in a new city? Make sure to Reverse image search any images to avoid scams. Just Upload your image or find through url.